The boxed spring that once supplied the Broderick family with water is now covered over with blackberry. In spring a wild native clematis vine hangs beside it. The spring still flows. Its water is piped under Rowells Road. 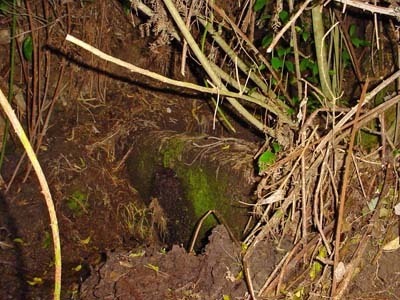 The pipe is cleaned out every year by the Wellington City Council. The Broderick’s are strongly connected with The Halfway and Glenside having lived in the Glenside locality for several generations. Broderick Road in Johnsonville is named after them. The Broderick’s first settled at The Halfway in 1845 on Section 19. On 4 August 1846, Creasy Broderick purchased 26 acres of land on Section 19 from Thomas John Drake of Drake Garden. “Broderick built a clay house of four rooms on the hill above, and lived there for a while before moving to Ohariu Valley in 1868.” The Broderick sons returned to The Halfway and farmed the following properties. Section 27, 1863. Property owned jointly by Creasy, William and Thomas Broderick. Sole owner Thomas Broderick in 1879. Section 26 & 28, 1890 - 94 acres purchased by Thomas Broderick. Section 31, 1903 - purchased by William Henry Broderick, who lived on site. Section 25, 1904, joint ownership to Alfred Thomas Broderick and William Henry Broderick. It was Thomas Broderick and his wife and family who came to live on Section 27, where the spring is today. The water from the fresh water spring was boxed and piped and gravity fed to the house. 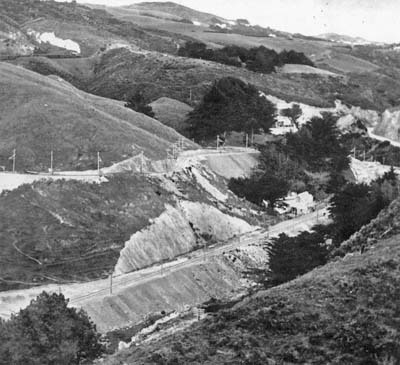 The house was at the bottom of the hill, fronting onto the stream and Porirua Road. When the Wellington-Manawatu railway was re routed, the line of the deviation, known as the Tawa deviation, went through the Broderick’s farmhouse. The Broderick’s were built a new home on Section 26 in compensation. This home is now number 375 Middleton Road and has been beautifully renovated by its current owners. The original Broderick farmhouse wasn’t pulled down immediately. Two families lived in it during the tunnel construction. Once half of the house was lived in by the Kelly family. The Foxhall family lived in the other half. A temporary railway line ran in front of the front porch of the old farmhouse. Near the end of the railway project, the old house was demolished and the new section of line completed. The spring then became a water supply for farm stock. It’s now privately owned. The photograph depicts Broderick’s house prior to demolition. The spring is located above the house in the fold of the hill. The railway tram track route above the house was to become Rowells road after the new railway was built. Note the steam train on the original railway at the top left of the photograph.